Dr Watson's removal will spark a huge political row -- environmentalists accuse the US Government of orchestrating a campaign to have the scientist sidelined. They say Washington disliked Dr Watson's willingness to tell governments what he believes to be the unvarnished truth -- that human activities are now contributing dangerously to climate change. "Luckily, the science of the IPCC is very strong," she added. "No matter what Exxon and the US tries to do -- they cannot change that." What the environmentalists do fear, however, is that documents produced for politicians may now be less forceful in their presentation -- they are not convinced that Dr Rajendra Pachauri will be so strong an advocate for change in global energy policies as Dr Watson. They claim humanity's influence on the climate has been overstated -- that the changes we see around us today are the products of natural variability. "I believe Dr Pachauri does have integrity -- I hope he has the integrity. He is an economist; he is a technologist. I thought co-chairing with Dr Pachauri was an appropriate solution but we have a democratic process and a majority of the countries in the world thought it was time for a change." Did Exxon Mobil Get Bush To Oust the Global Warming Chief? Al Gore spoils Dubya's Earth Day. ExxonMobil has been allowed to veto the United States government's selection of who will head the prestigious scientific panel that monitors global warming. Dr. Robert Watson, the highly respected leader of the Inter-Governmental Panel on Climate Change, was blackballed in a memo to the White House from the nation's largest oil company. The memo had its effect last Friday, when Dr. Watson lost his bid for re-election after the administration threw its weight behind the "let's drag our feet" candidate, Dr. Rajendra Pachauri of New Delhi, who is known for his virulent anti-American statements. 1) Watson's bid for a second term was, indeed, not supported by the Bush administration. Instead, the State Department announced on April 2 that it would support Pachauri. Two days later, State Department spokesman Philip Reeker tried, unsuccessfully, to convince reporters that this was not a slight to Watson. 2) Exxon Mobil lobbyist Randy Randol (who declined to take Chatterbox's phone call today) did indeed forward a memo to John Howard, senior policy associate at the White House Council on Environmental Quality, a little more than a year before the Bushies announced their decision to ditch Watson. (The memo was made public by the Natural Resources Defense Council, which acquired it under the Freedom of Information Act.) The memo noted that Watson "was hand picked by Al Gore and served in the Clinton/Gore White House Office of Science and Technology Policy." The memo accused Watson of wanting "to get media coverage of his views before there was a chance for the process to challenge his personal agenda." (Watson denied this in an April 5 interview with Salon's Damien Cave.) Here is what followed, bold-faced and indented: "Issue: Can Watson Be Replaced Now At The Request of the U.S.?" The obvious thrust of the memo was that yes, he can and should. 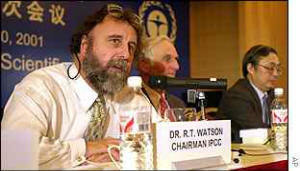 3) Rajendra Pachauri, and not Robert Watson, was last week elected chairman of the IPCC. 1) Who wrote the memo Exxon Mobil's Randy Randol forwarded to the White House? Logically, it should be Randol, or someone who works for him. Chatterbox still thinks that's very likely. But Exxon Mobil spokesman Tom Cirigliano told the Associated Press on April 19 that no one at Exxon Mobil wrote the memo—that Randol merely passed on a memo prepared by some mystery third party. "We've never taken any kind of public or private position on the subject of Dr. Watson or the leadership of the I[P]CC," Cirigliano said. This overlooks a note from Randol on the fax cover sheet, which begins, "Attached is a brief memo outlining the issues," which certainly sounds like an endorsement of its contents, as does Randol's promise to "call to discuss the recommendations regarding the team that can better represent the Bush Administration interests until key appointments and re-assessments are made." If Randol didn't write what followed, Chatterbox is tempted to accuse him of plagiarism. Whether someone at Exxon Mobil actually wrote the memo or not, Exxon Mobil was clearly making its desires plain. 2) Did the White House can Watson because Exxon Mobil told it to? This can't be proved. An administration source tells Chatterbox that the Exxon Mobil memo was never forwarded to anyone else at the White House or in the State Department and that the White House Council on Environmental Quality has no input on who runs the IPCC. But if Exxon Mobil took the trouble to send the memo to the CEQ, it's likely that it also forwarded the memo, or at least made the same argument, to others at the White House and the State Department. (If Exxon Mobil didn't do so and instead let the matter drop after it had lobbied the wrong office, the company should immediately fire its Washington staff for incompetence.) It's also likely that other energy companies expressed similar views to the White House about Watson. No one but an energy company (or a law firm representing one) would bother to bring the matter up. [T]he man President Bush has just chosen as the leader of the world's most prestigious environmental body has even called for, in his words, "a worldwide movement which boycotts American goods as a source of global pollution." …[He] is also the principal opponent of President Bush's stated policy that developing countries should share in the reduction of greenhouse gases. Pachauri's tactic is to insist that the United States and other highly developed nations make drastic reductions in their emissions of greenhouse gases before less developed nations (like his homeland of India) are forced to. That makes him hostile to market solutions in which U.S. companies upgrade inefficient plants overseas as an alternative to reducing carbon dioxide output in less-dirty plants in the United States. Which is, indeed, the approach favored by the Bush administration. The larger point, though, is that Bush would just as soon not do anything about global warming. Backing a candidate likely to embroil the IPCC in a paralyzing spat between Western and non-Western nations is a pretty good way to achieve that. Did Exxon Mobil come up with the idea not just to ditch Watson, but to back Pachauri? If so, the company probably should fire its Washington lobbyists. Why? Because Pachauri's call for a boycott was directed specifically at none other than Exxon Mobil! A. G. (Randy) Randol III, Ph.D.
Date/Time: 6 Feb. 2001, 10:00 a.m. Attached is a brief memo outlining the issues related to the on-going IPCC negotiations on the Third Assessment Report. I have also attached other material that may be useful to you. I will call to discuss the recommendations regarding the team that can better represent the Bush Administration interests until key appointments and re-assessments are made. 1. The IPCC is on schedule to issue in late September 2001 its Third Assessment Report (TAR), composed of three Working Group Reports on the science, impacts and mitigation of climate change and a Synthesis Report. The IPCC is headed by Robert Watson, an American who is also the chief science person at the World Bank (Director, Environment Dept.) Watson was hand picked by AI Gore and served in the Clinton/Gore White House Office of Science and Technology policy. His tenure at the IPCC ends with the completion of the TAR. However, he could be extended at an IPCC session this year or next. During the Hague meeting in November, Watson presented a sneak preview of the Third Assessment Report with the following caveat .. None of the conclusions presented in this report are taken from the TAR, but are consistent with the draft conclusions, which are subject to change until final government approval and acceptance early next year." His statement belied his real intent, which was to get media coverage of his views before there was a chance for the process to challenge his personal agenda. Issue: Can Watson be replaced now at the request of the U.S.? The Working Group Reports are prepared by scientists, economists, engineers, and others, Including some persons from industry and environmental organizations. Each report includes a "Summary for Policy Makers" (SPM) that is approved by IPCC governments by consensus in a line-by-line review at a Working Group session with the underlying report (approx. 1000 pages) accepted by the Group at that session. 3. White House U.S. Global Change Research Program: Michael MacCracken, Executive Director National Assessment Coordination Office. Bierbaum and MacCracken were both actively involved in the production of the US National Assessment that has been roundly criticized for its political and scientific bias. The National Assessment was driven by a political schedule to help the Gore campaign. Several controlled leaks were used to get maximum media attention since Congressional oversight forced a delay in the release of the report. Issue: Have Bierbaum and MacCracken been removed from their positions of influence? Issue: What was the U.S. position on the WG1 Report? Did it reflect the comments received? While the SPM was written to highlight the "human fingerprint", it also states that: "Further research is required to improve the ability to detect, attribute and understand climate change, to reduce uncertainties, and to project future climate changes." "The United States is way off meeting its targets," said Watson. "A country like China has done more, in my opinion, than a country like the United States to move forward in economic development while remaining environmentally sensitive." China, of course, has no commitments under the Kyoto Protocol and its greenhouse gas emissions are growing and will soon exceed those of the U.S.
2. Working Group II is scheduled to meet on the "Impacts of Climate Change" in plenary in Geneva, Switzerland, from February 12-16. Reportedly, the U.S. has submitted comments on the draft report by January 8, which was the deadline. Those comments have not been made public. Issue: Who has reviewed those comments? Issue: What is the U.S. position on the report? Issue: Who will represent the U.S. at this meeting? 3. Working Group III is scheduled to meet on "Mitigation of Climate Change" in plenary in Accra, Ghana, from February 28 to March 3. Government comments on that draft report/SPM are due to be submitted by January 29. Issue: Who will represent the U.S.? What is U.S. position? 4. On April 4-6, 2001, the full IPCC is scheduled to meet in plenary in Nairobi, Kenya, to accept by consensus the results of the three Working Groups. Issue: Will the U.S. revisit the Working Group I comments of the Clinton/Gore representatives? Issue: Who will represent the U.S. and what will be the U.S. position? Issue: Can this report be deferred until the US has provided updated input (30-45 days)? 5. The last element of the TAR Is the Synthesis Report (SR) that is still being drafted under Robert Watson's control. A draft of the SR, including its SPM, is to be sent out for simultaneous expert and Government review and comment with a deadline of May 29. A second draft is scheduled to be given to Governments only for their review and comment on July 6 with a deadline of August 31. The IPCC plenary will meet in London from September 24-29 to adopt/approve the Synthesis Report by consensus. Issue: Can this report be deferred at least 45 days? Thereafter the entire TAR will be released (in time for political use at COP-7). COP-6, held in The Hague last November, ended without finishing its work on implementation of the Kyoto Protocol and with an understanding that it would meet again in 2001, but with no date established. The SBI and SBSTA are scheduled to meet in Bonn, Germany, from May 21-June 1. Same Parties want COP-6 to reconvene during that time. COP-7 is scheduled to meet October 29-November 9 in Marrakech, Morocco, together with the subsidiary bodies. 1. Restructure the U.S. attendance at upcoming JPCC meetings to assure none of the Clinton/Gore proponents are involved in any decisional activities. a. Appoint Dr. John Christy, University of Alabama-Huntsville (Lead Author-Working Group I) as science lead for the balance of the IPCC process. Phone: 256.961.7763 This replaces Bierbaum and MacCracken. d. Detail someone from the State Dept to work under the direction of Christy/Lindzen for the "consensus negotiations". This replaces Moitke. 2. Request that the April 4-6 full IPCC meeting be deferred at least 30 days until a reassessment of US input can be made. 3. Request that all action related to the Third Assessment Report is deferred until the lPCC process is complete (30-45 days). This must include the Watson release of the draft Synthesis Report. 4. Explore the possibility of asking Speaker Hastert to make Dr. Harlan Watson, Hse Science Committee, available to work with the team. Dr. Watson has been recommended for the Assistant Secretary of State for Oceans position.